← Chocolates Starring At The Northwest Tarot Symposium! Why do we read cards? What’s so special about the Marseille Tarot? How can the cards uncover our blind spots? What does it mean to live a magical life, when we allow the stories that the cards tell us to offer solutions to our real problems? The images in this book are from Carolus Zoya’s Tarot de Marseille, a rare Tarot deck made in Turin at the end of 1700. The deck is from the private collection of K. Frank Jensen, and the images are being used with his permission. Elias notes that context is everything, and that the answer to the question unfolds from the question itself via the images in the cards. In her readings she combines the cunning-folk method of reading (based on making logical inferences about the meaning of the cards) with the visual argument method (which relies on the subjective and individual art of perceiving). 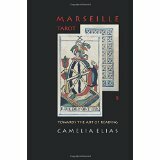 “Marseille Tarot” features full-length readings, based on real-life tarot consultations, which is a tremendous boon to understanding Elias’ method of reading. The stories that evolve in Elias’ readings are based on first hand observation of the categories of Embodiment (human, animal, celestial), Function (to lead, to split, to cut, to illuminate), Gesture (sitting, walking, pointing, howling), and Voice (silence, loudness, beyond the verbal). Each card is presented with a full color scan, a short discourse on the card and its function, a short question (with three cards drawn in response, all presented as full color scans), an interpretation of the cards, keywords for the card being discussed, function for the card being discussed, health indicators, and public life. Functions include: The Popess (cunning woman, study), The Lovers (partnership, dividing), Strength (overpowering, dominating, enduring), and Temperance (measuring, moderating, regulating). Health indicators include: The Magician (stress, nervous agitation, migraines), Justice (respiratory problems), and The Devil (binding, enslaving, manipulating). Public life includes: Death (with Justice, forensics analyst), The Stars (with The Moon, a spa), and Judgment (with The Hermit, gurus). There is note made of color and numbers, and how they apply to the cards. For the Court cards, Kings are seen as symbols of power, Queens as emblems of truth, Knights as Emblems of development, and Pages as symbols of initiation. At the end of the book we see several readings interpreted. The card images are full color, and gorgeous! This book is well written, beautifully formatted, with a stunning full color interior and a list of references that impresses! It is packed with information that is meant to be put to use. Whether you are a beginning student, a Tarot Sage, or somewhere in-between, you will find wisdom and value in this book.